With the election of Donald Trump people have been trying to figure out how exactly he got elected. They apply statistical analysis and a host of other factors to come to certain conclusions about his voters and exactly how he got elected. While normally I detest the left and their endeavors, it seems like on this issue they are more objective than the right wing analysis of how Trump got elected which seems to just be them trying to show that Trump isn’t a racist. One example is an article by Musa Al-Gharbi over at The American Conservative which is very much on the defensive saying that racists were not the people that elected Donald Trump and that in fact Mitt Romney got more of the white vote in 2012 and Trump won because he had better margins with minorities. While factually Al-Gharbi is correct, the problem with his analysis is what he leaves out is how important were these minority groups in some of the key swing states of Pennsylvania and Michigan? However to my surprise the left has actually produced a lot of material about how Donald Trump in a more objective way than I honestly thought they could. I guess they take the saying that knowing your enemy is half the battle to heart in this case. Trump did not spearhead a white uprising: participation rates among whites were roughly equivalent to those in 2012 and lower than those in 2008. 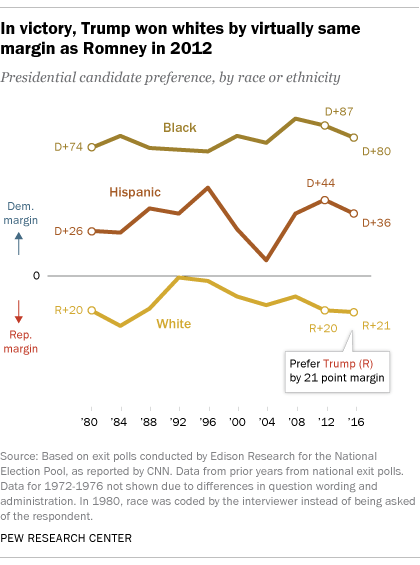 In fact, whites made up a smaller share of the electorate than they had in previous cycles, while Hispanics and Asians were better represented. 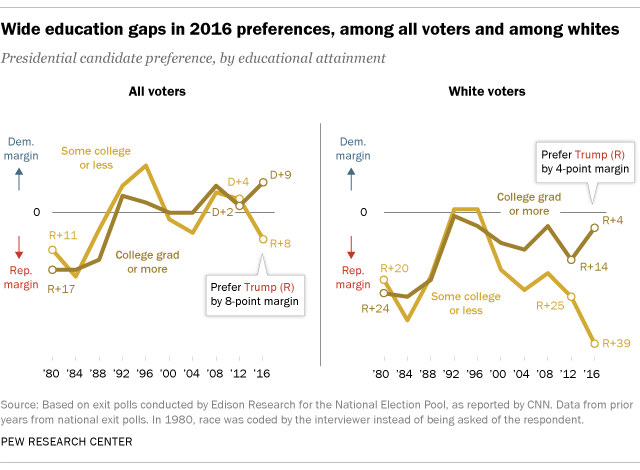 While Trump essentially had the same margin of white voters as Romney, if you look at whites without a college degree Trump increased their Republic voting margin by +25 to a +39, while among college educated whites he went from a +14 point margin to a mere +4 point margin. Meaning that while Trump didn’t really increase white margins on a whole, he did very well in some categories and less well in others. So it’s hard to maintain the view that Trump didn’t affect the white vote when we have white subcategories undergoing dramatic shifts. But even what I just said is kind of misleading. Because while you might be thinking that the Trump voting base was then a lower income/working class voting surge then you’d again be wrong. Donald Trump’s voter were about even economically both white and all other races. About one third making less than $50k, another third making between $50k-$100k, while the last third making more than $100k despite him winning over more white’s without a college degree since at-least before the 1980 election and non college educated people of all races since 1988. In fact even among the highest earning white Trump voter, they were the least likely of all three income categories to have a college education. However compared to Romney in 2012, the Republican nominee went from winning 38% of voters making less than $50,000 a year to winning 41% of those voters making less than $50,000 a year. But those numbers also show that Trump won less of those voters making more than $50,000 a year than did Romney in 2012. Now this is a lot of information, but it’s also important to note that Trump did not win the popular vote. So you can analyze the whole of the US all that you want and you’ll miss the larger picture. Trump could’ve lost every state that he lost by a 100 point margin, meaning every voter in that state voted for Clinton. But he could’ve just won all the states he did by one voter in each state and still win the electoral college. So, in the key states that Trump won (Iowa, Wisconsin, Michigan, Ohio and Pennsylvania) which haven’t been won in several election cycles by Republicans, merit more attention because those are the states that were able to propel Trump to the electoral victory. And let’s just say that it wasn’t the blacks in Cleveland or Detroit that flipped these states red. It was a smaller white largely union/working class communities that pushed Trump over the edge. Although not huge in numbers they were enough to let Trump to win Michigan by a couple thousands of votes of several million votes cast. In a piece by Thomas Edsall, he shows that Trump was able to win over small towns that were for the first time seeing more non whites come into their communities. He gives a couple of anecdotal evidence of small towns outside larger cities in those key states mentioned above switching over to Trump after having voted 55% + for Obama in last election. But of all those cities he cites that they have all had increases of sometimes several hundred percentage points of an increase in the non white population. This graph that Edsall uses in his article further pushes his point. What the graph shows is the surrounding areas outside of the top 50 metro areas with the red line showing where Trump did better than Romney. And from this graph we see that Trump did very well in very largely white areas than compared to Romney. To what Edsall says is due to Trump’s rhetoric about immigration. First, as recently as 2000, many of the key Midwestern counties that moved from blue to red in 2016 had very few minority residents. Since then, their immigrant populations began to increase at a rapid rate well above the national average. Second, at the same time that immigrants are moving in, younger native-born residents are leaving in droves to seek employment elsewhere, while the remaining white population is aging and is often hostile to change. It is the perfect formula for cultural conflict, and Trump proved to be the perfect candidate to exploit it. Finally, these changes are taking place in a region that Austin points out is home to “15 of the nation’s 25 major metro areas with the sharpest black-white segregation,” making it even more unreceptive to nonwhites than other sections of the country. Basically, as Benjamin Newman makes the case, an initial increase in immigration produces a lot of hostility among the almost homogeneous white area and causes an out lash. In this case the out lash was voting for Trump in 2016. This is supported by another study which showed that when you show white people whose racial/ethnic identity is high that whites are going to become a minority by 2042, that they support anti-immigration policies more and Trump more. But, what the study also shows is that white people who don’t have a high racial or ethnic identity support Trump less when showed the data. This could explain why we see Trump and Romney winning whites by almost the same margins. Although Trump gained many whites through his rhetoric he also lost many. But, since the US doesn’t use a popular vote system but rather an electoral vote total vote doesn’t matter. Trump was one of many presidents who was elected without winning the popular vote, in fact. So we need to look at the key states that Trump was able to win and the people in those states. For these states we’ll analyze Michigan (1988), Wisconsin (1984), Iowa (2004), and Pennsylvania (1988). To give perspective, I put in parenthesis the last time these states we won by a Republicans in an election. For the data we’ll use CNN’s 2012 exit poll data and their 2016 exit poll data. In Iowa 2012 the number of non-whites was so small that there is no data on their voting patterns, but from the 93% of white Iowan voters, Iowan whites voted 51-47 in favor of Obama. But, in the 2016 election, the 90% white electorate voted 54-40 in favor of Trump. A clear white swing vote. We see similar numbers in Wisconsin. In 2012 the 86% of voters that were white voted 48-51 Obama, but switched to 53-42 Trump. But here we actually have data on the black and latino voters and we can see whether they’re votes helped Trump at all. The 7% black voters in 2012 voted 94-6 for Obama, and again making 7% of the electorate in 2016 they voted 92-6 for Clinton. The latino voters in 2012 made up 4% of voters and voted 66-31 for Obama, and making 4% again in 2016 voted 63-34 Trump. So clearly we have some small black gains in Wisconsin with less Latino vote for Trump compared to 2016. But how much did their votes make an impact? Let’s take the CNN number that a total number of 2,925,566 people voted. And let’s see if Trump could’ve won Wisconsin if he had the same margins that Romney had in 2012 among minorities while keeping his 2016 white margin. And if you do the math, then the 2016 vote would’ve gone from 1,405,284 vs 1,382,536 Trump to 1,335,520 vs 1,289,589. Now the numbers don’t align properly and are missing about 200,000 voters but that’s due to rounding,smaller minority groups not counted and invalid ballots. But we see that Trump would’ve still won Wisconsin. So clearly Wisconsin and Iowa were won because of their white gains and not minority gains. I wont bore you with the explanation of the analysis of the other states, but I’ll do the same thing for the other states and show you what we get. And if the percentages of the electorate aren’t the same from 2012 to 2016, then I’ll use the the 2012 data. Michigan stays Trump even if we use the slightly lower white turnout from 2016, but still by a razor thin margin. However of all the states the only place this doesn’t hold true in is in Pennsylvania where Obama was able to get what seems like huge amounts of black turnout, or Trump was able to get huge white turnout. Because whites, in 2012, were 78% of the electorate in Pennsylvania but jumped up to 81% in 2016. But even if Trump didn’t win Pennsylvania, Trump still wins electorally by 284-247. So the idea that Trump only won because of lowered minority turnout and his gains with minorities isn’t true. Even fighting against the minority margins that Obama was able to get in 2012, with his white margins he wins most key swing states except for Pennsylvania which still allows him to win. And I double checked with Florida and found that even with Obama minority show up and margins, Trump still would’ve won. So, although Trump didn’t receive any record number of white votes and essentially matched the margins that Romney made, in specific areas Trump was able to have the white voters switch sometimes decade long patterns of voting for the Democratic party, to voting for him in a more rural/suburban working class white movement.